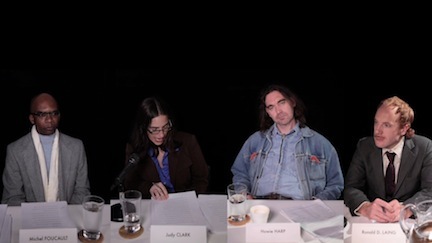 Thirty years after this event, Chicago artist, activist and educator Mary Patten revives the forgotten dialogue of “Schizo-Culture.” In her four-channel video installation, titled “Panel,” she directed four performers to re-enact the debate among Foucault, the post-structuralist philosopher; R. D. Laing, radical anti-psychiatrist; Howie Harp, former mental patient; and political activist Judy Clark. The setting is austere—white table, glass water pitcher, cigarette, ashtray, notebook, pen. “I was living in New York in 1975 and was completely oblivious to this conference,” says Patten. It was only years later that she learned of the strange event from her friend, the panelist Judy Clark. “We were both members of the revolutionary May 19th Communist Organization, a descendant collective from the Black Panthers and Weather Underground, devoted to the liberation of political prisoners.” The two women remained close after Clark was imprisoned for seventy-five-years-to-life in the Bedford Hills Correctional Facility for her role as a getaway driver in the 1981 Brink’s robbery that left three people dead. “Panel” shows through February 23 at Threewalls, 119 North Peoria.